Sir Winston Churchill British Prime Minister. A brilliant orator his speeches were an inspiration to the British people and the Allied Forces. In May 1940 he became Prime Minister following the resignation of Neville Chamberlain. 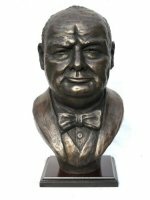 Churchill was noted for his speeches and in the dark days of 1940 they became a source of strength to not only his country but the rest of the free world as we fought against Germany. 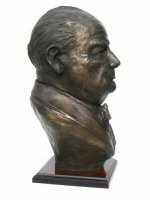 When I was creating this Churchill bust I listened to a box set of his wartime speeches - these contain some of the greatest pieces of oratory ever used in the English language, and gave me a deep insight into not only his utter determination not to surrender to Nazi agression, and a great sadness at leading the country into another war so soon after the bloodbath of the First World War, but also the brilliant use of humour. 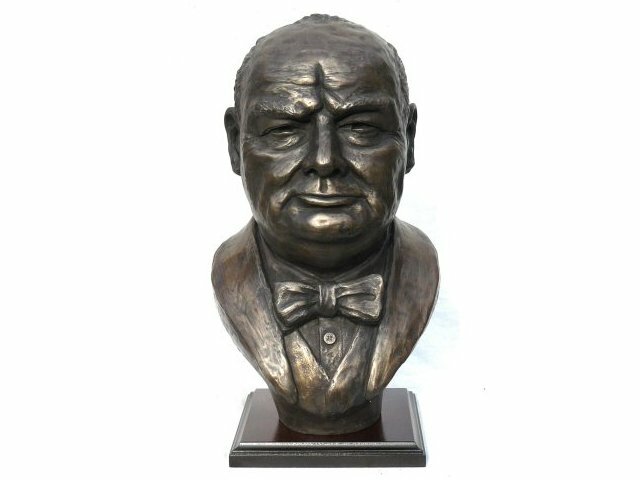 I have tried to capture all these different emoitions in my bust of Churchill. 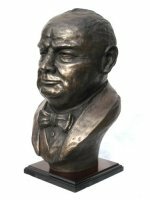 This cold cast Bronze Winston Churchill Bust is made entirely by hand by sculptor Peter Close in his studio in Somerset. 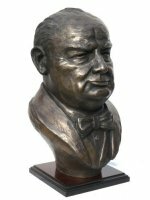 Each limited edition Winston Churchill sculpture is hand engraved by Peter with its own unique edition number and will come to you with a signed certificate of authenticity.